Today's project has very sparkly, shimmery wings like a real dragonfly or damsel fly, I achieved this by adding some Wink of Stella to my project once it was finished. Wink of Stella is a glitter wand and is available in two colours - the clear one I've used today, and the Gold Wink of Stella. I love this product so much that I always want to use it as a liquid eyeliner - it's so gorgeous! 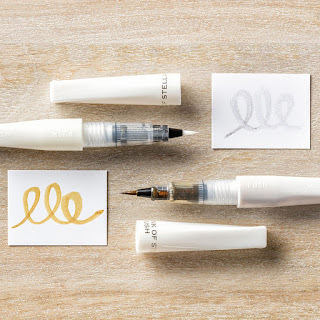 If only Stampin' Up! made a make-up version! I used Pear Pizzazz, Wild Wasabi and Garden Green as my shades of green for this card - I think they really stand out. After stamping the dragonfly I painted on some Pebeo Drawing Gum. Then I sponged the colours listed above. 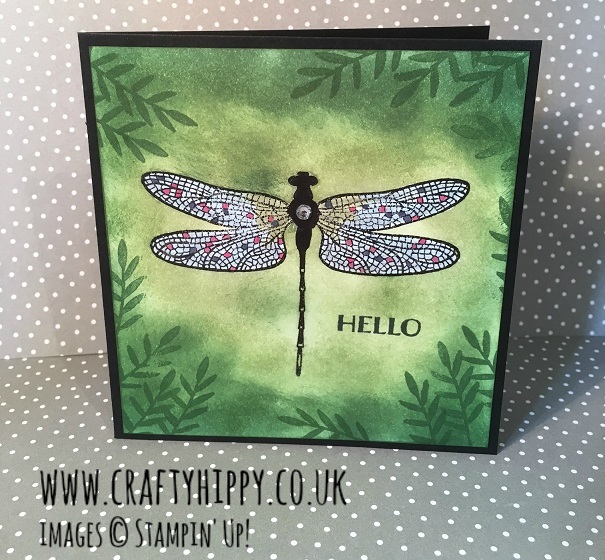 The dragonfly is from the Dragonfly Dreams stamp set.